The last house we bought was our first opportunity to have garden beds . After I placed the first raised bed we quickly realized we needed more. 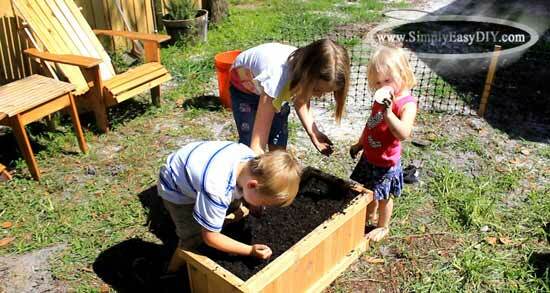 Gardening was infectious, fun and gratifying. The kids enjoyed getting a free pass to play in the dirt and mom and dad enjoyed the wholesome family time that gardening provided. So when we sold that house and bought our new house, I knew raised garden beds were one of the first projects I was going to have to take care of. Every time we go to the store, a request is made to visit the garden section. Inevitably new flowers are picked out and laid claim to by each of the children. They love gardening. Sometimes I think they enjoy it even more than their parents. Peas from a can is hard to get anyone to touch them much less eat them. Peas from the backyard however are the hottest ticket at the dinner table. I believe it is important to let our children have at least some ownership of family activities. Give them a spot in the garden they can call their own and watch not only what they plant flourish, but you also get the benefit of watching your children flourish as well. NOTE: Unless otherwise noted all board lengths are 8' (96") long. 8 - 1x4 Bottom Slats @ 12"
22 - 1x4 Side Slats @ 11"
4 - 1x2s Long Side Rails @ 28"
4 - 1x2 Short Side Rails x 13 1/2"
NOTE: The cut list above has been updated to reflect board widths available in stores and lumber yards thus making the project easier for those with limited tools and know how. Simply gather the boards required at the store and hand the cut list to whoever is assisting you in the board cutting area. 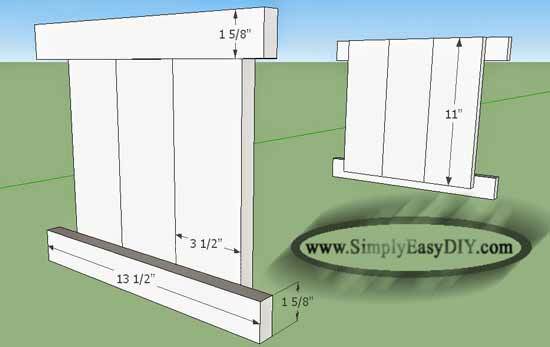 The 1-5/8" measurement in the pictures below represents a more cost effective method as the rails can be cut from the 1x4s by simply ripping them in half. This lowers the overall cost of the project but requires additional tools. If you choose to go this route then simply omit the purchase of the 1x2s above. 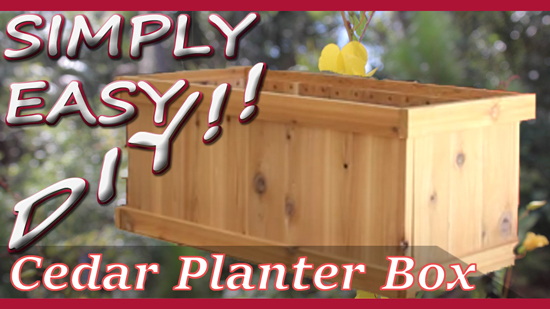 I did a previous video and blog post on a vertical garden planter. If you have not seen that video or read the blog post you can click here. A few questions came up more than once so I thought I would address them here in this blog post for this video and post. I did not use glue. Their are a couple reasons I do not like to use glue for projects like this. First, outdoor projects are going to be subjected to the harsh conditions of the outdoors. That means that whatever species of wood I choose to use, it is going to want to bend, swell, warp and repeat. Moist conditions will swell wood. Dry conditions will shrink it. It is going to want to move. Glue is more of a static conditioner. It holds pieces in one place not allowing for normal movement that a wood project will want to naturally do when exposed to the elements. 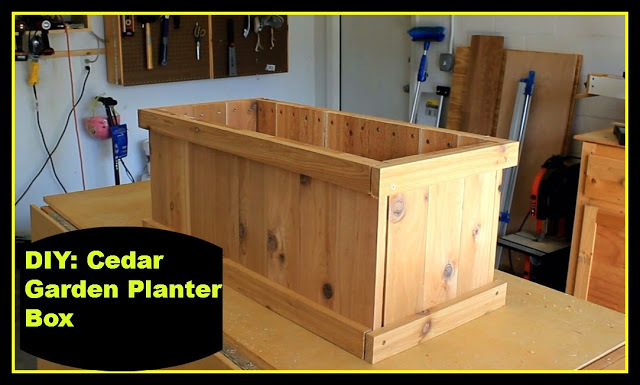 Using screws allows our cedar garden planter box to expand and contract, warp and sway as it needs to be able to do without prematurely over stressing the structural aspect of it. The second reason is that I just do not like chemicals of any kind for a project that I plan to plant and harvest food from. I am not saying that glue would leach anything into the soil. In fact, I will say that I do not know if it would or not. However, I am an error on the side of caution kind of guy, so as for me and my house, I have decided to not use glue for garden projects. This same premise is why I do not line my garden projects with plastic. I had a friend say to me once, "but it would last longer if you did line it." We had to agree to disagree because my thought was if water or moisture somehow gets between the lining and the wood then it would still show a propensity to mold and rot. Plus the outside of the project is still exposed to the elements and as I stated earlier, I do not like chemicals around my food so I am not going to apply any wood protective chemicals. I have learned to be happy with how long wood lasts outside on its own. When it is no longer able to perform its original task, then its wood chips will make great mulch for my garden beds. Interested in seeing an update to this project? Then click here! 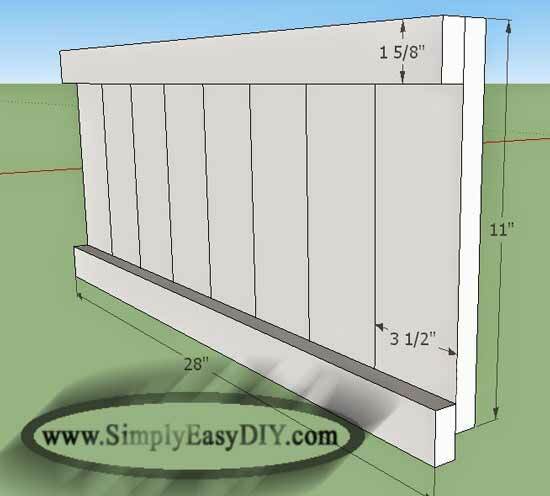 Your supply list says use 1x4x8 boards, however; the schematic shows 3 1/2" width boards. Did you cut them down to that size or is that a typo? A 1x4 board is 3-1/2" wide. It is the difference between the nominal dimension and the actual dimension. Nominal lists the size of a board in its rough state. So a 1x4 board of any length is actually 3/4" thick by 3-1/2" wide. The tag at a lumber yard will most likely say 1x4. My 1x4 was not 3 1/2 but 3 3/8ths so I was short by about 1 inch when putting on the sides!!! Furring strips are 3-3/8". Sometimes lumber yards will sell them as regular 1x4s because of the cost difference. That's why it is always good to make sure of the width of boards before beginning a project. Perhaps someone will see this comment and it will save them the same trouble. I would have just trimmed the horizontal trim pieces down by one inch to compensate. Thank you for the great and detailed explanation. Do you have any concerns about the metal screws coming in contact with the soil? Specifically when planning on harvesting food? Is their a specific reason you had in mind that I should be concerned about? Rust? Exterior screws are coated to prevent rusting. Evan if they weren't iron oxide (rust) is a normal component of dirt. Plants normally use iron in their growth processes and so do people. If their is a study suggesting otherwise, I don't know about it. Was there some other reason? No, no other reason. I am new to this and am just learning about organic growing. I want to ensure integrity of the process. Should the coating that you mention raise concerns? I am guessing it is a chemical coating? Would it be better to put the screws on the outside of the box rather than the inside? I suppose that would be dependent upon the type of coating for the screws you are using. The most common type I'm aware of is a zinc coating. So if zinc is of a concern to you then don't use that type of screw. I don't know of a reason to be concerned about zinc but I'm sure someone does. You will find their will always be something wrong with everything. We all have to pick our poison on some level. If I have to pick between some type of coating on a few screws vs rust in my soil vs unknown pesticides and who knows what else was done to my food, I'll take the first two options every time. Even if something I do isn't the best, it's still better than the alternative. Agreed? Makes sense. Thank you Stan. Hey, can you please put the dimensions and cut sizes in cm? Thanks! Can you please put the dimensions in cm ? Thanks! My screws are splitting the cedar; what kind of screws are you using? Zinc is not poison in the amounts screws would or would not put in the soil. People take zinc in tablet form probably in much larger quantities. Self tapping exterior screws. Are you predrilling holes. Predrilling is a MUST at the ends of boards even if using self tapping screws. Plus the type of wood used will play a role in its tendency to split. Cedar is notoriously difficult. Predrill with a #10 countersink bit if using #8 screws may help. Drive screws slowly and don't over tighten. 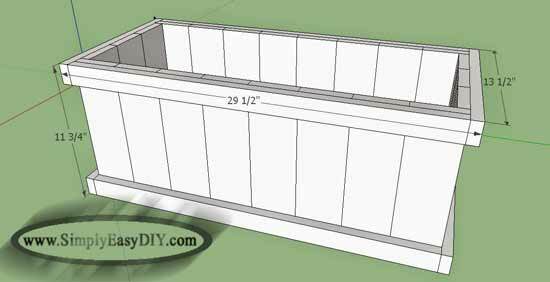 how would I do this design with 2'wX6'wX6'wX24"h dimensions? Basically for a corner? Your dimensions don't make sense to me. You have three widths listed. Looks great! How much top soil did you use? Loved the video! I don't have a mitre saw or a table saw. Is this the kind of project that can be done without this sort of equipment? Thanks. Absolutely it can be done without such tools. I designed this so it can be done with just a simple screwdriver if need be. If you live in the U.S. both Home Depot and Lowes will cut everything to size for you. Just gather the boards and give them the cut list. Then just take them home with a box of screws and have at it. The 1-5/8" wide boards can be substituted for 1x2s. Perhaps I'll update the materials and cut list to reflect. How many 1x4's would I need if I wanted to keep the same height and width measurements as your planter but make it 40 inches long? Can you use 2x4's instead?